Pocket Books/Star Trek, 9780743492553, 400pp. 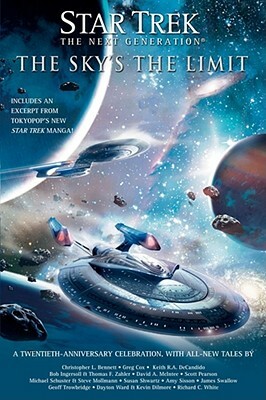 Taking its title from the final words spoken by Captain Jean-Luc Picard in the series finale, The Sky's the Limit is a collection of brand new original stories spanning and celebrating the entire twenty-year history of the most popular and successful Trek series of all. Stories by a variety of authors -- some old favourites, some new -- set during the events of the television series give the authentic feel of a newly discovered 'missing season' of Star Trek: The Next Generation. Contributors include Christopher L. Bennett, Greg Cox, Keith R. A. DeCandido, Bob Ingersoll & Thomas F. Zahler, David A. McIntee, Scott Pearson, Michael Schuster & Steve Mollmann, Susan Shwartz, Amy Sisson, James Swallow, Geoff Trowbridge, Dayton Ward & Kevin Dilmore, Richard C. White.